The PremiumCord SATA 3.0 cable is equipped with a special metal latch to ensure it doesn't work itself loose. Supports all common speeds - 1.5gb/sec, 3gb/sec and 6gb/sec. The cable is very flexible and allows smooth and secure transmission of your valuable data. The 0.5m cable also meets the RoHS compliant certification requirements. SATA, eSATA (6 Gbit/s) Done! For shipping to other EU countries visit this page PremiumCord 0.5m SATA 3.0 data cable. 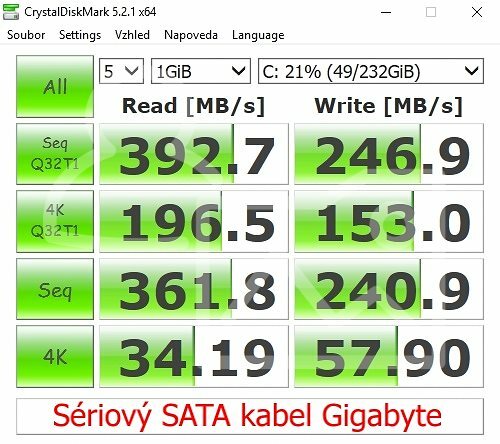 Für Versand nach Deutschland, besuchen Sie bitte PremiumCord SATA III 0,5 m. Chcete doručit zboží do Česka? Prohlédněte si PremiumCord SATA III 0.5m. Chcete doručiť tovar na Slovensko? Prezrite si PremiumCord SATA III 0.5 m. Für Versand nach Österreich, besuchen Sie bitte PremiumCord SATA III 0,5 m. Magyarországra történő kiszállításért tekintse meg ezt a termékoldalt: PremiumCord SATA III 0,5 m.